Looks fairly innocent, right? Well look again. What does it say at the top? Trev: “Wait a minute! Why don’t we say something like “from the director of HARRY POTTER”? Bliss: “Shut up. I’ve got it – We say “From the studio that brought you HARRY POTTER”! 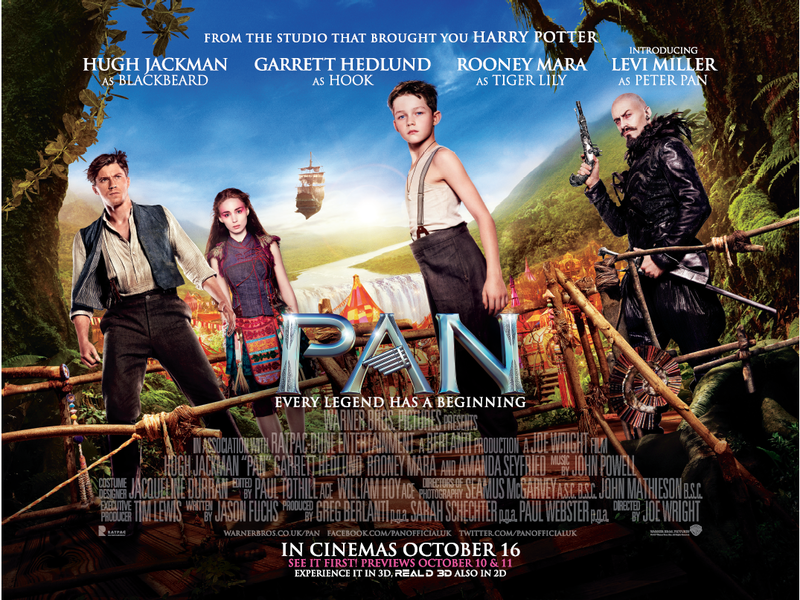 Okay, so Warner Brothers were the studio that brought us Harry Potter, but to infer that Pan has any creative similarities to Harry Potter just because Warner Brothers is behind it is a little bit disingenuous in my opinion. So what if they made Harry Potter? They also made such classics as Battlefield Earth (shudder), Catwoman (whoops), The Adventures of Pluto Nash (remember that classic? ), Carpool (oh dear), and the god-awful remake of Arthur with Russel Brand. Okay, I’m done. Until next time. This entry was posted on October 26, 2015 by Pete. It was filed under Uncategorized .